It is exactly one hundred years since that historical secret meeting on a train of three significant representatives of Britain, France and Germany who came together to discuss the terms of the Armistice Agreement, a document of such immense importance that would finally lead to ‘the peaceful sound of silence’ in the trenches and on the battlefields of a four year war that changed the world. 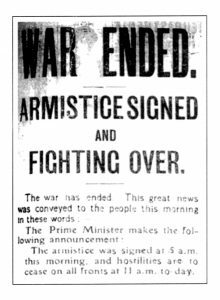 The signing of the ‘Armistice’ took place, after three days of deliberations, at 5.15am on 11th November defining the long awaited moment of the beginning of the end of the 1914-1918 War. A ‘peace without victory’ was hoped for by the defeated armies of Germany, but stern terms and conditions were imposed to ensure that there would be no further hostilities and the fighting could not be restarted. 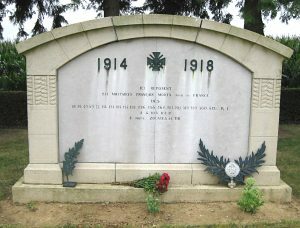 But even though the Armistice took effect officially on eleventh hour of the eleventh day of the eleventh month, it was many months before the Peace Treaty of Versailles was negotiated and signed on 28 June 1918. The ending of the conflict echoed throughout the world but even though ‘normal’ life resumed, life would never be the same again. 100 years on, we must always remember those who never came back, and gave all their tomorrows for our today. 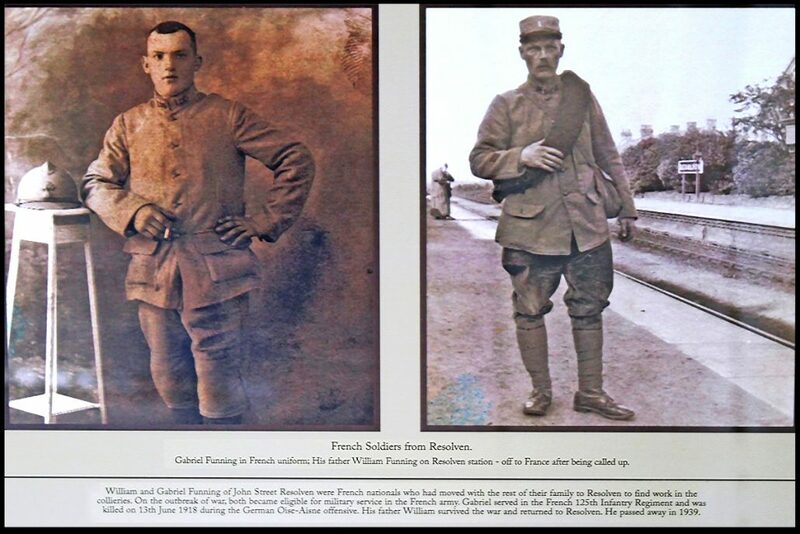 The following are some photographs of men, with local connections, who were involved in the conflict. “This is thought to be the place where Gabriel Funning of Cross Street Resolven lost his life. Gabriel grew up in the Welsh Community and according to family tales, could speak little French. 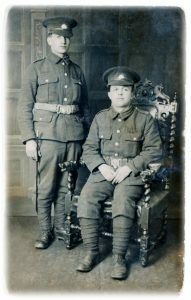 He courted my grandmother and they were engaged to be married, but in 1914 because Gabriel and his father Walter had not become naturalised British, they were both conscripted into the French Army. 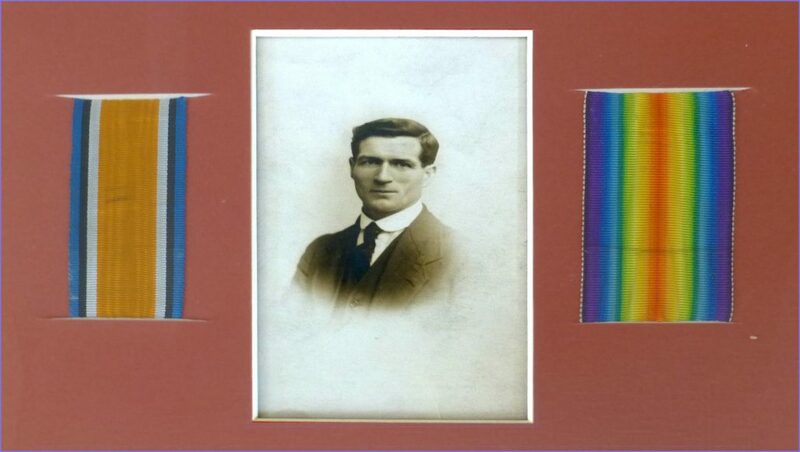 Walter survived the War but on the 12th June 1918, as Gabriel was due to come home on leave, he was killed in action. For his bravery he was posthumously awarded the ‘Croix de Geurre’ with a Silver Star. The citation reads:- For leading an attack on enemy positions”. 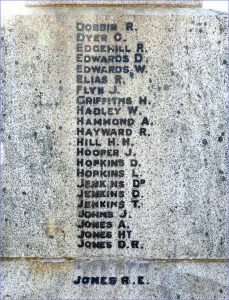 Gabriel’s name is listed on the Resolven Cenotaph and on the same side of the Memorial at the very top; Captain Mark Haggard is also remembered. Captain Haggard can’t be claimed as a Resolven born man but he married the elder daughter of Vaughan of Rheola in 1913. Sadly, he was killed in action just over a year later in 1914 while serving in the trenches with the Royal Welch Regiment. 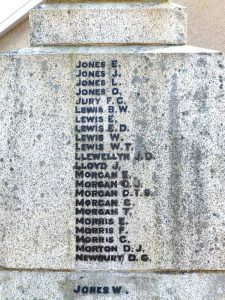 He is said to have uttered the words ‘Stick it the Welsh’ as he lay wounded and that quotation, to this day, is above the clock in Maindy Barracks, Cardiff. The man who carried him from the battlefield, William Fuller, was the first Welshman to receive a VC in World War One for his brave action. 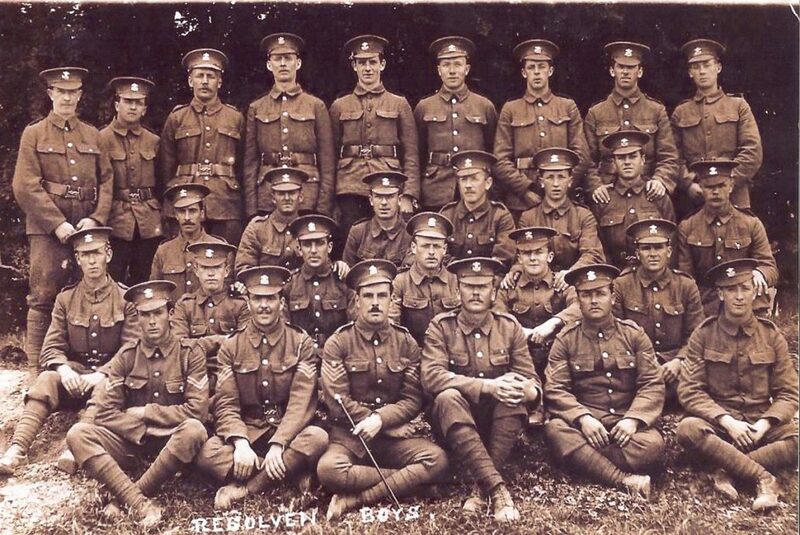 This photograph is of Stephen Jones serving with the South Wales Borderers in the Great War. He was a Resolven man married to Hilda and had three children, Eric, Jeanette and Brenda – Brenda being well known to the village as ‘Brenda the Shop’. Brenda says “My dad was exposed to mustard gas. He served on the Somme, at Gallipoli and Passchendaele where he was taken prisoner and he spent the rest of the war as a POW. 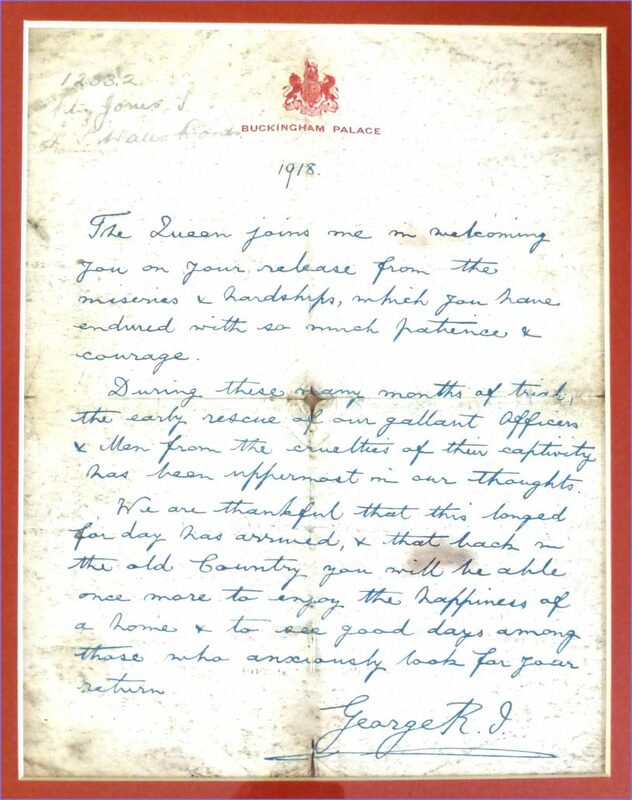 He received three medals, which we treasure, and a letter from the King at Buckingham Palace on his return home. 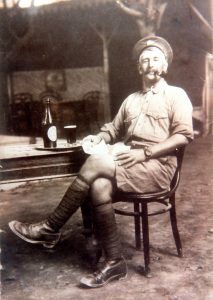 This is Ioan Perkins who served in the Royal Engineers in the Boer War before fighting in World War One. He served in the Dardanelle Landings with the British, Australian and New Zealand forces and after the War, he served in India, Africa and the Middle East. Ioan’s son, also Ioan Perkins of Neath Road, was kind enough to lend us the above happy portrait of his father. 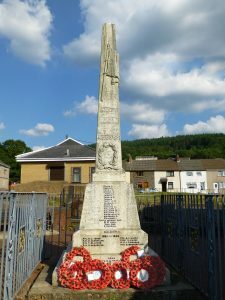 Gerald Billen from Clyne had two grandfathers who fought in the first World War. His Grandfather David James Davies was known as Dai 31 because there were half a dozen men with the same name living in Melincourt at that time and he happened to live at 31 Bryn Terrace. A photo of his other grandfather Eddie Billen was provided by another grandchild Kay Eagles (daughter of Phyllis). She says “I’m afraid I don’t know much about my grandfather as far as his rank or regiment goes but I think my grandfather had something to do with horses in the Great War. After the war he went down the mines in Resolven and worked there until he was over 65. All I can say is that he was such a kind and gentle man who loved his children and grandchildren and his wife Eileen. We loved him very much”. 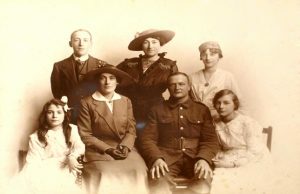 This family portrait was provided by Hugh Morgan, grandson of Samuel Morgan of Clyne – seen here in uniform as a Sergeant in the Royal Welch Fusiliers. 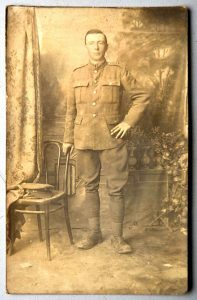 Sam served in France for four years and was awarded the DCM for his bravery. That medal was one of the highest awards given to non commissioned officers at that time. 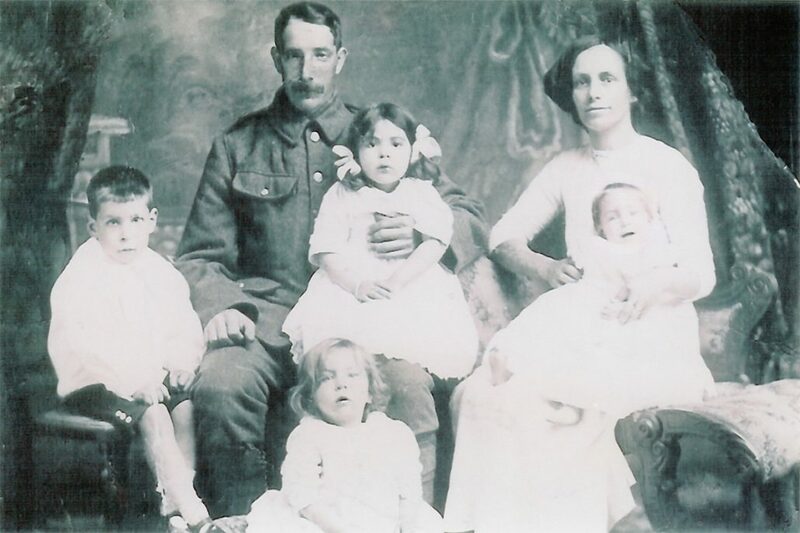 Sam survived the Great War and his family was well known in Clyne. Sarah, his daughter was involved with Clyne and Resolven Youth Clubs for many years. She was also in charge of the Meals on Wheels Service in the Neath Area. Marcia Watkins (The Sweet Shop/Post Office on the Square) provided us with this photograph of her great grandparents Thomas Henry and Sarah Anne Davies. 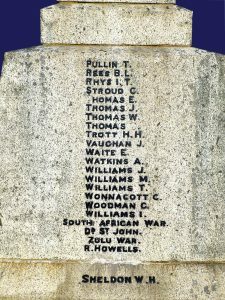 Thomas was in the Royal Field Artillery – the largest arm of the Artillery. It was responsible for the medium calibre guns and howitzers deployed close to the front line. During the first World War a whole new form of artillery was developed to meet the unusual conditions on the Western Front – trench mortar. The Royal Field Artillery provided the man power for these mortars. 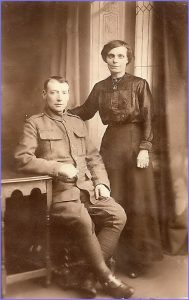 Unfortunately only 30 per cent of World War one records survived the London Blitz and even though I have my great grandfather’s service number, I have no more details of his service in France, but thankfully he survived what must have been a horrific experience for him and all the other men on the Western Front. 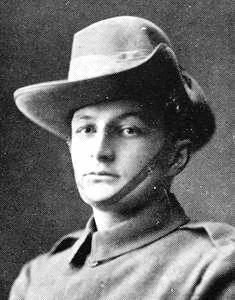 He came home safely and he and Sarah had five children, Thomas, Alma, Iris, Gus and my mother Jean Davies’s mother Louisa. The following information and photographs are provided by Ann Evans, daughter of former Head Teacher Reg Morgan. “The photo is of my grandfather Ifan John Morgan. I don’t know which regiment he was in but he was one of the lucky ones and survived the Great War. But back home, working as a miner he had a narrow escape when he was trapped underground in the mine above The Farmer’s Arms for a couple of days. His nickname was ‘Ifan shammpy long’ because whenever he was told to hurry up and the shift was over he used to shout ‘OK. Shan’t be long’. Ann also provided us with this picture of the Jury boys – related to her on her mother’s side through marriage. 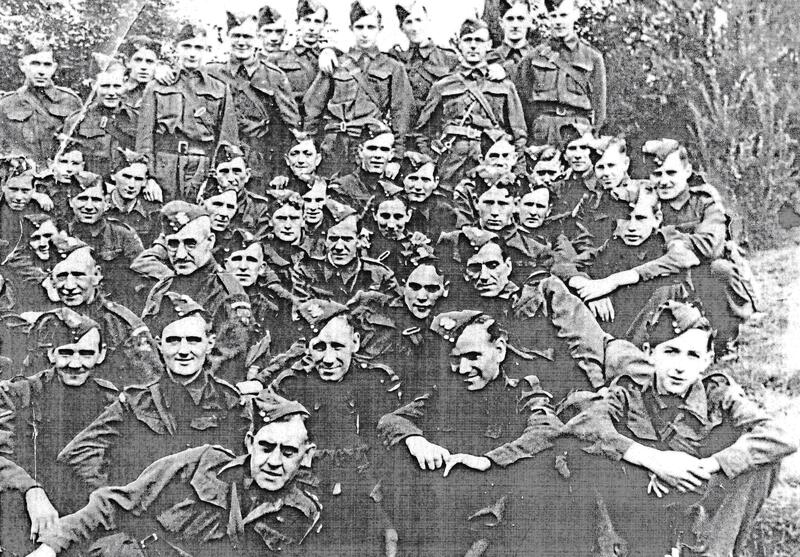 Tommy and Bob Jury from Melincourt came home safely, but their brother Fred was killed in action. Ann thinks he may have been as young as eighteen. 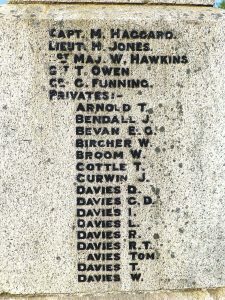 The Following are the names of the fallen in Two World Wars listed at the Resolven Cenotaph.